Riesling is a grape that can present a wide palette of aromas, from green apple and citrus aromas to honey, pineapple and floral aromas. The fragrances originate from a group of chemicals called terpenes, and there are six such substances which together dominate the scent palette of young Riesling. What we actually experience is the cumulative effect of these substances, not the compounds individually. In the must, terpenes are highly bound to glycosides but are partially released by fermentation. The higher the pH in the fermentation is, the more terpenes are released, adding to the olfactory structure of the wine. Therefore, the berries' must need to be ripe for the aroma to become rich and complex. 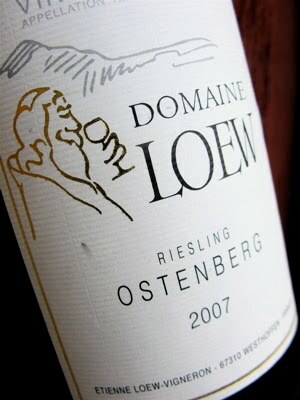 2007 Riesling Ostenberg by Etienne Loew in Westhoffen has a developed and complex aroma of orange blossom, ginger and honey. The flavour is rich, mild and supple with a mature and pleasant acidity that slowly evolves on the palate. A wine from oolitic limestone from the Jurassic period which is very similar both in terms of geological origin and aromatic character to a Altenberg de Bergheim. Price: € 10.